A few months ago, I was online shopping (shocking, I know), when I stumbled upon this printed shirt that read, “You achieve what you believe.” When I read it, I got all goose-bumpy and instantly knew I had to have it. Fast forward to last week when, instead of feeling tired and worn out after returning home from two days on the road giving presentations to full audiences, I felt rejuvenated. Why? Because I could smile and take a deep breath, knowing this was the life that I had dreamed and envisioned for myself, and after years of hard work, that I made happen (with help from above of course). With my new shirt on and the words sparkling and glittery, I ran with an ear-to-ear smile, remembering that my life didn’t always look like it does today. I have found my purpose and a place in the world where I can make a real difference. No longer am I the Kim Strobel who felt like she had to dance to the tune of what everyone else wanted her to be, or to douse her own light so others would feel better about themselves. No longer would I tolerate being criticized for looking different, wearing skirts that fell two inches below the knee (blog post to come later about that! ), wearing heels to work, thinking differently than someone else, or teaching in a way that felt aligned to who I am as a human being. I am truly thankful for the naysayers, criticizers, and blood-sucking gremlins that motivated the you-know-what out of me over the years. They have driven me to become the best version of myself. So what did I do and how did I change the way I was living my life? Well, lots of things. But first I started to change my beliefs about myself and began to love the authentically raw and real version of Kim. I had a feeling of certainty and faith in myself and about what was possible. I began to really feel in the depth of my bones that WHO I am and WHAT I have to offer was worth it. My beliefs became like a road map that had the power to guide me toward my goals. Step by step, thought by thought, action by action … I was able to move toward the things that I wanted most just by changing my mindset and being true to myself. 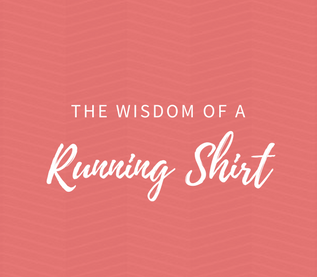 This is why the running shirt spoke to me on so many levels. Its simple sentiment reaffirmed that the beliefs we hold about ourselves are the most important. That our thoughts create our words, which create our actions, and eventually form the habits that shape our lives and become our every day reality. On the flip side, I also realized that I’d been working against my own interests every time I put limits on the beliefs about myself. I desperately wanted to make changes in my life, but I wasn’t allowing myself to take the first step. Soon I realized that this mindset stretched across all areas of my life and was keeping me from a lot of things—starting a new business, having hard conversations with others, deleting the toxic people from my environment, drawing much-needed boundaries, and taking time for myself. I don’t have all my mindsets and beliefs changed YET (as you know it’s still a daily battle deciding to eat an apple over two tempting Hostess cupcakes…the latter seems to win out often), but I’m working on it! And that’s a start. Sometimes we are unconscious to what we believe and how those beliefs affect our actions. Our limiting beliefs can cause us to miss out on the opportunities that we want most—and our empowering beliefs can propel us toward the life we want to live. What is a goal that you have always wanted to achieve and haven’t? Why haven’t you? What’s your reason? It’s likely a limiting belief … so, what do you need to do to make a change? Well, the first step is to replace the old, disempowering beliefs with new empowering beliefs. Even if you don’t believe them at first, you can still trick your mind. And the second step is to begin by being the truest, realest, most authentic version of yourself that you can possibly be!